Six leaders from organizations with successfully implemented dyads explain what it takes to develop effective partnerships between physician and nurse officers in complex systems. The American Hospital Association is releasing a series of three podcasts about leadership models that emphasize clinical partnerships between physicians and nurses, create synergy from the boardroom to the bedside, and improve patient care and safety. 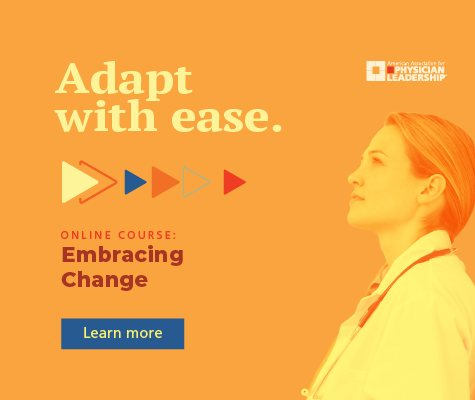 The podcasts, the Keys to Successful Co-Leadership, are an extension of initiatives begun in 2017 by an alliance of the AHA and the American Association for Physician Leadership which, working with the American Organization of Nurse Executives, leveraged information from focus groups to identify the key components of successful dyads. Six members of those focus groups – all from organizations with successfully implemented dyads – explain in the podcasts what it takes to develop effective leadership partnerships between physician and nurse officers in complex systems. Listen here or download to your device for later playback. The safety-focused model at the Cincinnati (Ohio) Children’s Medical Center supports the patient and family as members of the health care team, say Steve Davis, MD, MMM, chief operating officer, and Cheryl Hoying, PhD, RN, who is now chief nursing executive and executive vice president of the Joint Commission. They caution against moving too fast – executive dyad partners should first find common ground in each other’s organizational values, interests and beliefs – and emphasize building a level of trust in good and bad situations. Click above on downward arrow to download podcast. Kristen Ramsey, MSN, RN, is the senior vice president of operations and chief nurse executive at Northwestern Memorial Hospital in Chicago, Illinois. Gary Noskin, MD, is senior vice president for quality and chief medical officer. They sit together at meetings and comment on each other’s perspective. Viewed as a team with a single organizational voice, their modeling and mentoring dyad behaviors cascade throughout the organization, enhancing care delivery at all levels. In order for clinical dyad partnerships to work well, physician and nurse leaders must share the same vision and mission for clinical enterprise, say Kathleen Sanford, DBA, RN, senior vice president and chief nursing officer, and Robert Weil, MD, chief medical officer at Catholic Health Initiatives in Englewood, Colorado. They believe the decrease in silos at CHI – and the annual increase in patient care quality metrics – is the result of the synergy between physician leaders and nursing leaders and the dyad leadership model produced by the AHA-AAPL alliance and AONE.